Boris Teddy Bear is hand made in the finest brown cuddly soft plush from the Steiff Soft cuddly friends collection and carries the Stainless steel Steiff button in ear and yellow ear tag. 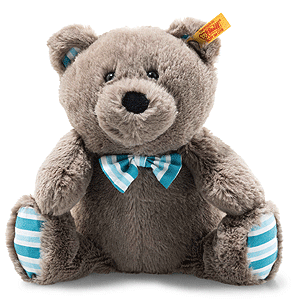 Boris Teddy bear is 19 cm tall and a great playmate. He is grey-brown and has bean bags in his arms, feet and bottom. The tail nub helps keep him sitting upright. His inner ears, bow tie and soles are made of fabric with light blue, white and turquoise stripes. A very cute contrast to his soft and cuddly plain-coloured fur. The right side of his mouth is embroidered black. A black nose completes the cheeky expression on his face.